When my daughter was an infant we noticed that her skin was extremely dry, itching and irritated. Her pediatrician took one look at her skin and diagnosed her with eczema. I realized that she probably inherited it from me as I have always had the same problem on my hands and fingers including dry, scaly itchy patches. 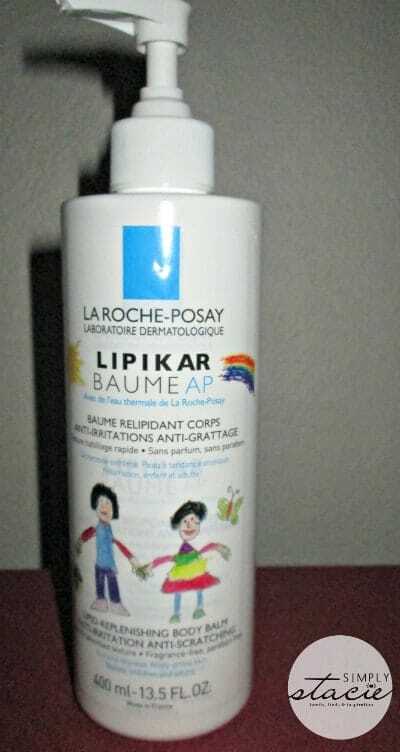 Over the years, I have tried so many different products to try to soothe our sensitive, eczema prone skin but it has been a challenge to find an effective product that can be used by both adults and children until I discovered Lipikar Baume AP by La Roche-Posay. To celebrate National Eczema Awareness month in Canada during the month of November, La Roche-Posay has continued the 100 Families Project initiative against Eczema which has the goal of providing resources and information to Canadian families who have children suffering from eczema. La Roche-Posay is a leader in the industry and provides specialty products specifically for people suffering from eczema or who have sensitive, problematic skin. In fact, La Roche-Posay is proud that they are the #1 brand recommended by dermatologists for people suffering from eczema. My daughter and I have started using Lipikar Baume AP on a daily basis which is now available in a limited edition bottle that has a label that was selected as part of the “Itch-free” day contest when children suffering from eczema were asked to submit a picture showing what their perfect itch-free day looks like. I love the sweet whimsical label designed by the winner, a six year old girl from Markham, Ontario! What I first noticed when using this product personally or after applying to my daughter’s legs and arms is that this cream is so rich, creamy and soothing. Lipikar Baume AP (SRP $33 for the 400ml bottle) was designed to enhance the skin’s moisture barrier by replenishing lipids and nourishing the skin. As a result, skin can become much less dry and itchy as related to eczema and other dermatitis conditions. I find this product to be extremely moisturizing without being greasy and I like that it absorbs into the skin quickly after application. Another positive benefit is that I only have to apply this to the skin once a day to notice results i.e. when skin is just barely damp after taking a shower or bath. In fact, my skin stays moisturized longer after one application of this product per day than other brands that require constant applications. A small amount of this cream goes a long way and therefore I expect one bottle to last a long time. I also appreciate that Lipikar Baume AP is fragrance free so it doesn’t irritate Hannah’s asthma and after using it for only three days, she made the comment that she wasn’t scratching her skin as much especially at night when she normally digs at her legs/feet. You are invited to visit La Roche-Posay to browse the entire selection of high quality skin care products and find the perfect match for your personal skin care needs. I highly recommend Lipikar Baume AP for anyone suffering from eczema and it would be perfect for use during the harsh winter which can really leave skin irritated, dry and itchy. Lipikar Baume AP is available for purchase at Canadian pharmacies and select retailers. Canadian readers are invited to learn more about how to enter enter the new 100 Families (For a Better Life with Eczema) contest! I’d love to try the Mela-D Pigment Control Concentrated correcting serum. Anthelios Melt-in Cream SPF 45 is my top pick to try first! Every year, La Roche-Posay Canada helps 100 Canadian families, selected with the assistance of dermatologists, to help them live a better life with eczema. They have an inflammation center! I’d like to try their Iso-Urea Body Milk. Im not canadian and accidently entered. I would love effaclear gel.